Mode Junkie: black and gold. these shoes are the latest addition to the collection! although i say this to almost all of my new shoes, but i am really smitten. they have the alexander wang feel that i cant explain. LOVE IT! i seriously should stop saying i love things. this kinda love has made my bank account weep month after month. not your typical love, huh? anyway, i have been on the search for jeans for like forever to a point of no avail. these babies need to have a replacement or else i will wear them until they get holes in the crotch. ew. they´re a tad long (boo says short people) but i just cant for the life of me give to my tailor as i fear he´s gonna ruin it. no offense tailor! wow, süße die kette ist der hammer. sieht so super aus zu den boots! hammer! i didnt know h&m made pretty shoes like those! this necklace looks so good on you! ps. Schöner Blog - ab zur Liste. Hey I read your blog everyday,and I love your pictures and I love your style more and more .I like the golden details of these boots.I like your outfit too. I'm 5'0, pants are hell to find. oh those shoes are SOOOO good. wow. amazing! i'm drooling over the shoes! Those boots are amazing and I cannot believe they came from H&M!!! As for the jeans I can only say Cheap Monday. Thats what I go for, what suits me best and whats not too expensive. Should try them on one day! The sweater is great too! Was it on sale or is it the "normal" collection? Loving it! As I mentioned, beautiful necklace! I like yur style alot! And these shoes are gorgeous! your outfit is so cute! 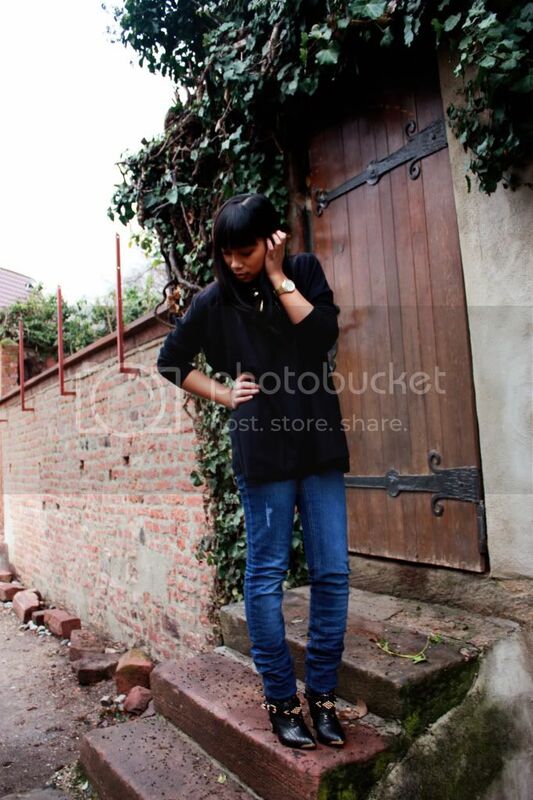 I love it <3 ah those shoes! I love the black & gold combo. Especially loving your booties - very hot! Wow, h&m has been stepping up last months, this boots look nothing like h&m! Wow I can't believe these boots are H&M. What a brilliant design! my gawd...im inlove with those boots!!! on coats, inspirations and snow..
it started snowing when you laughed.